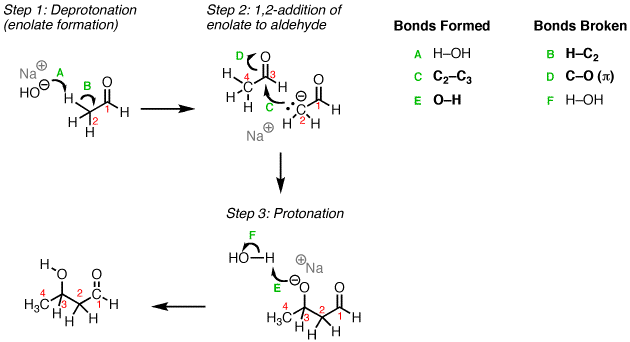 Description: The Aldol reaction is the addition of an enolate ion with an aldehyde or ketone. 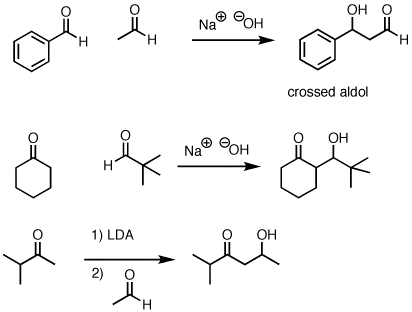 I am slightly confused about the first two examples as it seems that the enolate formed from the least substituted carbonyl compound without the use of LDA? Aha! Look more closely… what enolates are possible here? Hi, is there possibility to use Na2CO3 like a base? What would be different? Thx, P.
Sure, one could use Na2CO3 as a base – it’s probably reacting with water present in solution to give trace amounts of HO- , which is doing the deprotonation. Na2CO3 isn’t the greatest base in the world however.